Product information "HAIX Missoula, FS"
These HAIX® Missoula Factory Seconds were built especially to be hiking and wildland firefighter boots. The lighter weight alleviates leg fatigue while on those long hikes, since the less weight you have on your feet, the less energy you have to expend while walking. These HAIX® Missoula Factory Seconds use thicker, breathable European leather and minimal seaming to increase stability and also durability of its boots. These HAIX® Missoula Factory Seconds are not suitable for HAZMAT but they are a dual purpose and can be worn as hiking or wildland firefighter boots. Whichever of the two may it be, the Missoula is guaranteed to provide you the support, comfort, and durability needed to fulfill such events or activities. Related links to "HAIX Missoula, FS"
Customer reviews for "HAIX Missoula, FS"
I got a pair of these last season, they were my first pair of hikers. I got them on a whim because they just happened to work for one guy on my crew. They turned out to be the perfect boot for me. Maybe the other hikers fit people well, but I'll never know how they feel as long as these are in production. I didn't have time before a roll last season to get new I soles so I rolled with the stock ones. After that roll I never switched them out. I have high arches and they were at peak fit a week in. The total break in was probably a week and a half and even then I didn't have any blisters or hot spots. They're for sure one season boots, so definitely keep an eye out for deals. The tread was good enough everywhere in R3, and they did just fine when we rolled in R5 & R6. Super impressed by the look, quality, and comfort of these boots. They are great wearing right out of the box. Can't wait to wear them on a trip to Europe, where I plan to do a lot of walking/hiking. My son is a wildland firefighter and these are what he wears. Sometimes it's good to listen to your kid's advice. Who knew? Lol. Anyway, I'm going to convince my wife to get a pair so she'll be able to keep up with me. Also, they'll fit perfectly if you order a half size smaller than your actual shoe size. I am a woman and needed Wildland boots which means buying men’s boots. I bought these and although they were a little wide for me I put arch support inserts in them and that tightened them up pretty well for me. I typically get horrible blisters in most work boots as my heels come out pretty far and rub but they don’t do yay in these boots so far at all. Always loved haix boots for fit and quality, the only complaint I have is these do tend to crush the top of my foot a little (worse before inserts than after) and they also rub my calf if I’m not wearing tall thick socks. Hoping they break in and those issues go away. Have been in whites and nicks for 24 years. Decided to go with the hiker type boots, they are amazingly comfortable and so light. They made long hikes to remote fires seem easy. Now the down side.... Durability is not there. Another reviewer has the same experience. Soles coming off and stitching doesn't hold up. I understand the idea that type Iof work and number is hours effects this. But when you name a boot Missoula and sell to wildland fire fighters you should understand we work incredibly long hours and in extreme conditions. And just accepting this and buying more boots isnt the answer. I got to see more support from Haix. I'm constantly asked about the boots and in this community word of mouth is everything! Better durability and more support from Hair! We appreciate you taking the time to submit a review on the Missoula. We are happy that you have found these boots to be comfortable and leightweight while on the job. We apologize that you don't feel that the durability is top notch and that you've had some issues with the soles coming off. Many of our other customers find the durability to be good. It is very important when wearing our boots to clean them regularly and use proper care and maintenance to extend the life of the boots. This will go a long way when spending long hours out in the elements. Thanks again for your comments. We hope this will not deter you from considering HAIX again in the future. I would have given these a ten due to comfort level, but after two short summer work seasons - a grand total of about 6.5 or 7 months - the sole of one boot has separated at the toe a full three inches back. Not sure if they can be fixed or not. Thank you for your review of the Missoula, FS. We are happy to hear that you found these boots to be comfortable out on the job. We are sorry that the sole of the boot has separated. It definitely depends on the kind of work you do and how many hours a day the boots are being put to work. Unfortunately, those soles are Vibram and cannot be resoled. 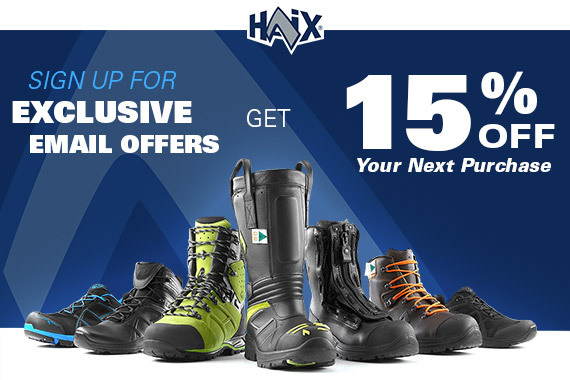 We hope this will not deter you from ordering another pair and that the overall comfort of our boots will keep you a loyal HAIX customer for years to come. Crushed top of my foot. Crushed the top of my foot. Been wearing whites and nicks.Thought I'd try these out. 4 hours into walking I could barely stand. (Before anyone says it,yes, I understand sizing and my size) outside of the crushing of my foot, they grip well, are lighter and breathe very well. My foot just won't fit the boot right, so I must sell them. (factory 2nd's) I'll try again in a few seasons when they've been on the scene awhile longer. We appreciate you taking the time to review the Missoula, FS. We are sorry to hear that they crushed the top of your foot. We have several other customers who really love this boots and have not had any problems. But every once in a while, we do have someone who just can't fit our boots and this may be the case for you. Other than that, we are glad that you felt that the boots were lightweight, had a solid grip and were breathable. We encourage you to possibly try a different model in the future to see if they work out any better. Best Boots I Ever Got ! I have no trouble with these boots they feel great,I could run with these boots all day long. Good job on making them the best fire boots that I have. We appreciate you taking the time to review the Missoula, FS. We are happy to hear that you like the fire boots and that they are the best you have had. Thank you for service and we hope you'll continue to be a loyal HAIX customer in the future. great boot ! our department has no accepted these as duty wear and they are 10x more comfortable and light than boots like whites and hawthorns. We appreciate you taking the time to review the Missoula FS. We are happy to hear that your department find them to be comfortable and lightweight. Thank you so much for your service. Stay safe out there! I have put these boots through the test . They have been exposed to extreme heat and I have hiked for miles with them and they have held together strong. The comfort level is so high that I bought a second pair for everyday wear. I love them. I put my Nick's hotshots on the shelf because they do not compare. I recommend them for sure. Thank you for taking the time to give us feedback on your experience with the Missoula, FS. It's good to know that these boots have held up for you even after being put to the test through extreme heat and long miles. We also appreciate the recommendation especially in comparison to our competitors. Thanks again and stay safe out there! A bit stiff on the uppers, digs into back of heel. If tied tight, foot falls asleep. have not used on fire yet. Still trying to break them in. Thank you so much for taking the time to share your experience with the Missoula, FS. These boots can take a little longer to break in, due to the thick, full grain leather used throughout but once they are, I am confident you will find them to be comfortable and functional out on the job. We hope they will serve you well in the years to come. Great boots with no break in needed. I was wearing another pair of wildland fire boots, they were heavy and cause numerous blisters. These boots are lighter and have yet to cause a hot spot on my feet, let alone a blister. We are happy to hear that the Missoula's have served you well so far and that they are comfortable on the job. Great boots, right out the box, no break in needed. Worked several night shifts on the fire lines in Oregon in the Missoula. Excellent fit, no pressure points, excellent stability. Hiked several mountain trail miles on my days off in the boots, still like the boot. I have been using this boot for about a year. Used on fire detail in Washington and hiking everyday on the job with the Forest Service. Great boot. Holds up well. Comfortable, comes in wide sizes. If these ever wear out I will purchase again. Great fit right out of the box.